If you’re a marketer, you either love change or you hate your job. “The digital marketing landscape keeps evolving” has become nearly a cliché because it’s a reality everywhere you look. But first, some context: These marketing facts come from Salesforce Research’s fifth edition “State of Marketing” report. Back when our team was working on the inaugural “State of Marketing,” Instagram video was new, Vine was still a thing, “Promoted Pins” didn’t exist, and 18% of marketers were planning to introduce Google+ as a marketing channel in the coming year. Fast-forward to today. Whether managing a firehose of data, aligning metrics for a customer-centric experience, tapping into artificial intelligence (AI) tools, or connecting online marketing channels, marketers have their work cut out for them. Perhaps the biggest challenge for marketers lies in beating customer expectations. “It takes more tact and precision than ever to attract, acquire, and retain today’s savvy customers,” says Jon Suarez-Davis, Salesforce Marketing Cloud senior vice president and chief strategy officer. Suarez also notes that 80% of customers say the experience a company provides is as important as its products and services. Note that in our research, high-performing marketing teams represent 16% of the overall survey population. These top marketers are completely satisfied with their overall marketing performance and the outcomes of their marketing investments. It’s impossible to talk about marketing today without talking about customer experience. 45% of marketing leaders are using their unique knowledge and understanding of customers to lead customer experience initiatives across the business — up from 24% who strongly agreed with this sentiment in 2017. 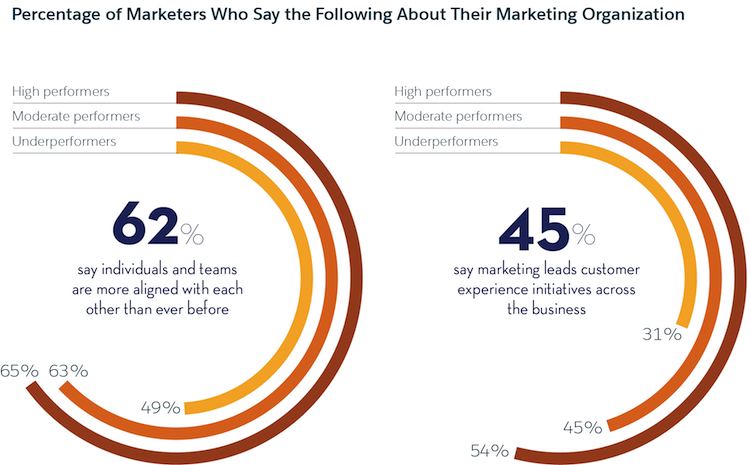 Among high-performing marketing teams, 54% lead customer experience initiatives. From a B2B marketing point of view, it’s worth noting that 69% of business buyers expect Amazon-like buying experiences, such as personalized recommendations. This makes it even more critical for sales and marketing teams to march in tandem. 62% of marketing leaders say individuals and teams in their departments are more aligned with each other than ever. They’re driving cohesive customer journeys across the whole of marketing, rather than just their own channel or function — the more aligned they become, the better they perform. 54% of marketers say they are empowered to collaborate with sales teams (a year-on-year growth rate of 86%), and 52% share common goals and metrics (a year-on-year growth rate of 87%). High-performing marketers are 1.5x more likely than underperformers to collaborate with sales teams on account-based marketing (ABM) programs. 87% of marketing teams share integrated technology stacks with advertising teams, underscoring the importance of unifying data to create the right experience on the right channel at the right time. 55% of marketing teams collaborate with advertising teams when evaluating and purchasing new technology. 55% of high-performing marketing teams build budgets with their advertising colleagues versus 40% of underperformers. Among industries surveyed, travel, transportation, and hospitality have the highest percentage of marketers who share integrated technology stacks with their advertising teams (92%). Connected customers and online communication channels mean marketing and service teams need to operate as extensions of each other. 60% of marketing teams track customer satisfaction, 59% track retention rates, and 53% share common goals and metrics with service teams. 55% of marketers collaborate with service teams to manage and respond to inquiries and issues raised on social media. 54% of marketers have a free and open flow of customer data between them and their service teams, while 53% share common goals and metrics. Marketers are using more data sources than ever. The average number of data sources has grown by 20% since 2017, and the median number of data sources marketers use is forecast to jump from 12 in 2018 to 15 in 2019. Marketers’ use of second-party data has grown from 58% in 2017 to 69% in 2018. Only 47% of marketers have a completely unified view of customer data sources, indicating that disconnected data is still painting an incomplete picture of customers. 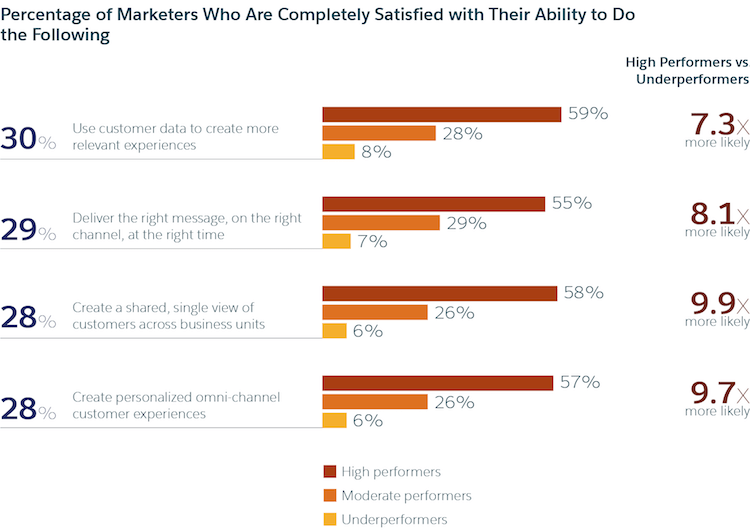 High-performing marketers are 7.3x more likely than underperformers to be completely satisfied with their ability to use data to create more relevant experiences. Among industries, the hospitality, travel, and transportation sectors anticipate their number of data sources will increase by 88% — up from eight sources in 2017 to 15 sources in 2019. The financial services industry predicts it will use 18 data sources in 2019 — an 80% increase, up from 10 data sources in 2017. Creating a single view of the customer is increasingly key to meet customer expectations. High-performing marketers are 1.7x more likely than underperformers to treat the ability to piece together unique customer identities as a critical marketing technology requirement. Marketers are using more data management platforms (DMPs). They expect to increase their use of DMPs by 64% by 2020. 55% of marketing leaders now report using a DMP, and another 35% plan to use one within the next two years. Previous research found that 79% of customers are willing to share relevant information about themselves in exchange for contextualized engagement, and 88% for personalized offers. 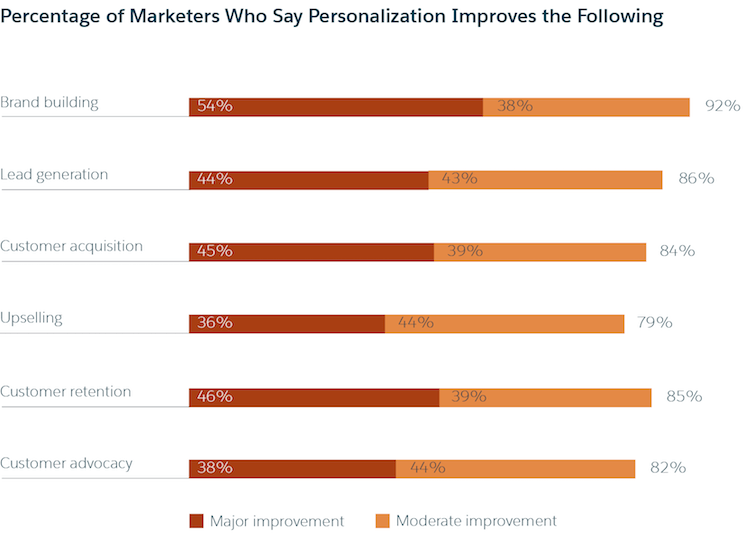 When marketers invest in personalizing customer experiences, they see clear benefits. 92% of marketers say personalization majorly or moderately improves brand building. 86% of marketers credit personalization with a major or moderate boost in lead generation. 84% of marketing leaders say personalization majorly or moderately improves customer acquisition. Marketers aren’t mind readers, but sometimes they’re expected to be; 62% of customers now expect companies to anticipate their needs. Marketers’ adoption of AI has grown by 44% since 2017. 29% of marketers now use AI (up from 20% who used it extensively in 2017). 44% of marketers use the Internet of Things/connected devices — up from 29% who used them extensively in 2017. 32% of marketing organizations are using voice-activated personal assistants such as Alexa and Siri. High-performing marketing teams are 3x more likely than underperformers to be using voice-activated personal assistants. 24% of marketers use virtual or augmented reality — for example, apps that allow homebuyers to calculate mortgage costs by pointing their phone’s camera at a house. 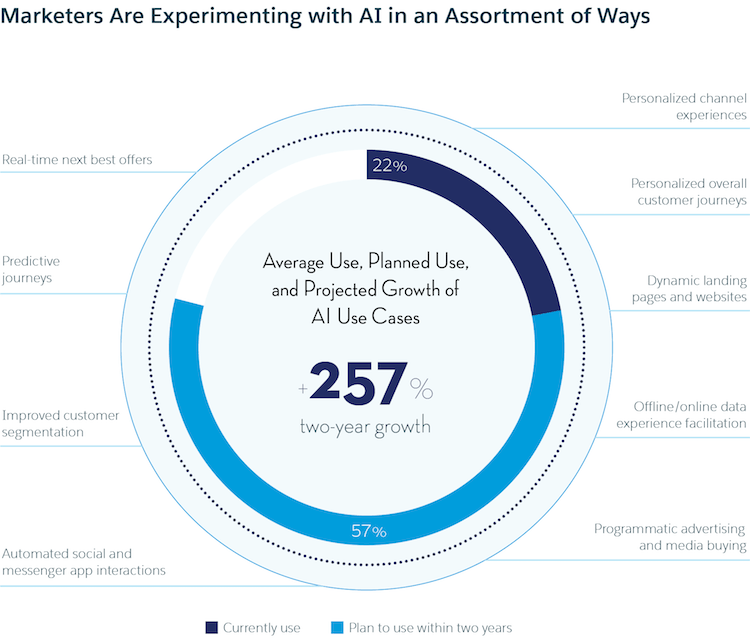 On average, marketers anticipate a 257% growth in AI use cases over the next two years (based on current and planned use). 51% of marketing leaders say they’re more mindful about balancing personalization with privacy than they were two years ago. Only 30% of marketers are completely satisfied with their ability to balance personalization with privacy, and about one-third admit that complying with regional and/or local privacy regulations is a challenge. Only 44% of marketers differentiate themselves by going beyond what’s required by law or industry standards for privacy. The marketing channels with the highest ROI for lead generation include social marketing, customer communities, and paid search or search engine marketing. Marketing channels with the highest ROI for upselling include email marketing, affiliate marketing, and social marketing. And channels with the highest ROI for customer retention include customer communities, email marketing, and social marketing. 52% of marketers engage customers in real time across one or more channels. High performers are 1.9x more likely than underperformers to engage customers this way. 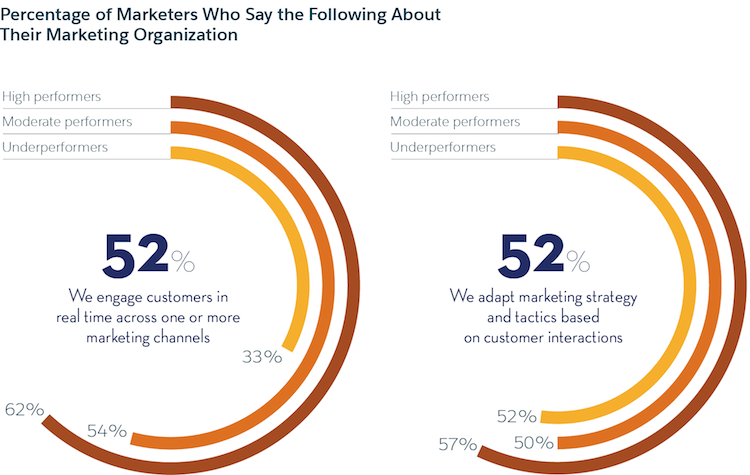 52% of marketers adapt their marketing strategy and tactics based on customer interactions and feedback. Marketers are forever chasing the perfect mix of integrated marketing that reaches customers at the right moment in time, with the right message. Only 28% of marketers are completely satisfied with their ability to engage customers across channels at scale. Marketers are striving to solve the omnichannel puzzle as more channels increase the risk of discord. On average, 32% of marketing leaders say a given channel is dynamically coordinated with others. This is up from 28% in 2017. Rates of duplicate channel coordination — where identical messages are broadcast across channels — have dropped from an average of 51% in 2017 to 39% in 2018. On average, 36% of high-performing marketers dynamically coordinate channels (where their messages evolve across channels based on customer actions) versus 26% of underperformers. 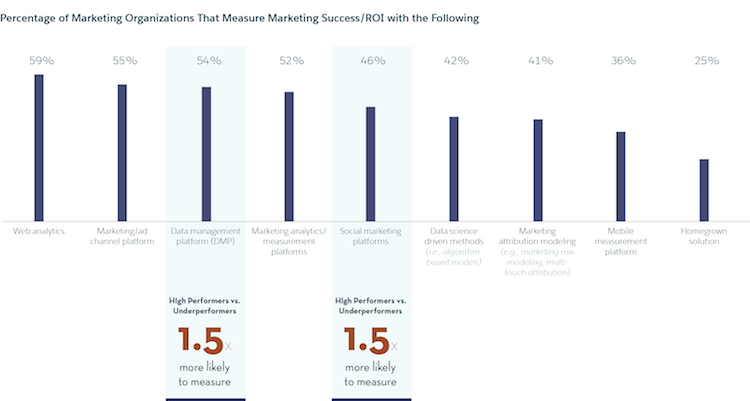 High-performing marketers are 1.4x more likely than underperformers to say traditional approaches to marketing measurement are no longer effective. 43% of marketers are now tracking customers’ overall lifetime value, while 49% track mobile analytics. 52% of marketers track how many and how often they receive referrals from customers, and 51% track how much it costs to acquire a given customer. It doesn’t take a crystal ball to see that the marketing landscape in 2019 will be more competitive than ever, as companies seek innovative ways to engage with prospects and customers. As this research shows, marketing is recentering around the customer experience, adopting artificial intelligence (AI), mastering data management, and driving real-time customer engagement. “Today’s consumers and business buyers alike expect convenient, relevant, and responsive engagement across every interaction,”says Vala Afshar, Salesforce chief digital evangelist. Our digital marketing research shows marketers are increasingly leading customer experience development by supporting and complementing other departments across the business to drive cohesive customer journeys. Marketers are adopting new approaches to manage and unify data. These approaches are helping marketers paint clearer pictures of customers’ and prospects’ needs, preferences, and behaviors. Our marketing research reveals that as customers demand personalization and privacy, marketers are struggling to find the right balance. It’s about taking advantage of the opportunities AI presents while avoiding the opaque data-use policies that have weakened customer trust. The latest marketing statistics show that mastering real-time personalized engagement across channels is still a challenge. One of the toughest customer experience challenges is how to successfully coordinate and connect the expanding number of channels. Nevertheless, marketers are combining established metrics with new KPIs to improve customer experiences and journeys.